Hamilton's first Automatic watches where the Hamilton Illinois brand in 1953. Shortly thereafter the Automatic K-series was introduced in the Hamilton line of watches. Illinois branded models were only produced for a couple of years and in 1956 the Accumatic line arrived on the scene. The early Accumatics shared a lot in common with the Illinois automatic models. Both lines ran ETA 1256-based movements. The 1256 was capable of all sorts of bells and whistles including a date complication as well as a wind indicator. One of the first Accumatics was the Accumatic II. It was introduced in 1956 and produced for three years. 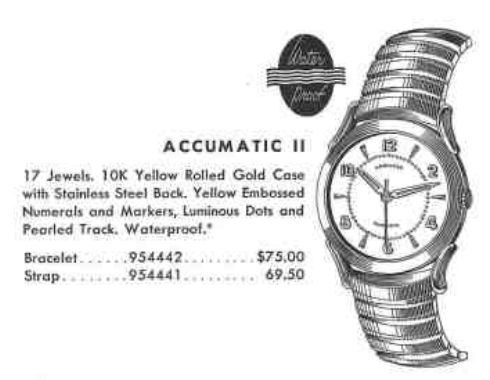 The Accumatic II was a little less expensive than the K-series models, mainly due to the rolled gold case. The white dial with embossed gold-colored numerals and markers came in only one pattern. I've seen Accumatic II's with a wind indicator, although the option wasn't shown in the catalogs. It would have a little window under the Hamilton name on the dial with numbers from 0-40 visible, depending on how much the watch was wound. That was available in the Signamatic line of the Hamilton Illinois models and I suspect Hamilton used excess movements up in the Accumatic II after the Illinois line was dropped. That's just an educated guess though. You don't tend to see the Accumatic II very often and I recently had the opportunity to buy one. It seemed to be in good shape but was sold to me in non-running condition. Other than a little bit of wear through to the side of the case by the 9, it was in very nice shape... on the outside, anyway. The stainless steel back unscrews from the gold filled bezel. These case backs can often be a real bear to open but I was able to break this one free without too much difficulty. The movement inside looks bright and shiny but I can tell it's been a while since it was last serviced. There's no obvious reason why it's not running though. Everything gets completely taken apart and thoroughly cleaned. Now things look really shiny. The reassembled movement is now running but only a timer will tell me how well it's running. Oh snap! This shot gun pattern on the timer means there's a lot of noise inside the balance. I'll have to look very closely at the hairspring to make sure it's not messed up somehow. It took a lot of fussing and although I got it to run eventually it was running with low amplitude (160 degrees), so I decided to swap the balance with one from a spare 672 donor. Now it's running much better... just a little fast but I tend to leave them like this as movements tend to settle a little over time. Before I seal up the watch I will add my mark to the long list of prior watchmakers who have serviced this watch. There are about a dozen marks inside the case back. A new lizard grain strap and fresh crystal complete the restoration. This is a sharp looking watch now and is running great. Another fine watch is saved. Thanks for posting this. I just inherited my great grandfather's Hamilton a couple of months ago. Couldn't locate any information about it till I found your page. Turns out it is an Accumatic II. Had it fixed up at my local jewelry store, put a Hadley Roma croc skin band in it and now it looks fantastic! Thanks again for your post, love your work!